No. 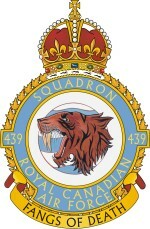 439 Squadron of the Royal Canadian Air Force was the overseas successor of No. 123 (Army Co-operation Training) Squadron, which formed at Rockcliffe, Ont., in January 1942. The ancestry of the unit can be traced back to the School of Army Co-operation which originated at Camp Border in 1932, moved to Trenton in 1936 and early in 1939 was absorbed by No. 2(AC) Squadron. the unofficial homepage of Tiger Squadron . .